It was a long time coming but finally the Philippines has it's very first e-Sports Bar and Lounge. 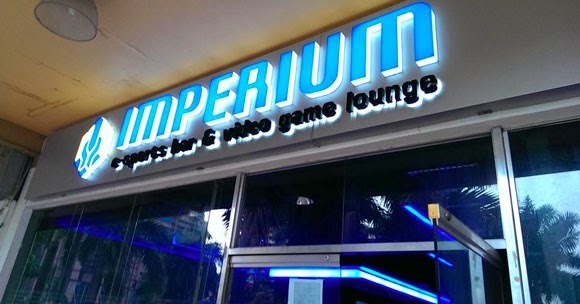 The Imperium is located at the Metrowalk in Pasig and unlike all the regular bars and restaurants we see there, this place focuses on giving gamers a place to stay and have a couple drinks while enjoying their favorite video games with friends. Not only is Imperium equipped with the best gaming Gaming desktops and next generation consoles, they also have all the booze a gamer can ask for. Rental rates are also very reasonable and you get a comfy chair or even a whole sofa to game all night with friends up until 2am. Now with more and more businesses taking e-sports seriously I wouldn't be surprised to see more of these e-sports bars popping up all over the metro. Go ahead and check the break to get a full list of their current game offerings and rates. PC rental is 60 pesos per hour. For Open Time rentals, a full hour rate will be charged after the first 15 minutes of the succeeding hour. We charge a 100-peso consumable door fee. This fee may be used toward the rental of PCs or consoles or for your food and/or beverage order. We are strict about verifying age by checking the IDs of those who order liquor. Alcohol will absolutely NOT be served to anyone below 18 years of age. Customers aged 16 to 17 are welcome but cannot order alcoholic beverages. Anyone aged 15 and below should be accompanied by an adult to be able to enter. More power to PV! I hope by 2014, united na ang SF Phils.